There’s nothing like the glitz and glamour of Hollywood to inspire a special event, birthday or even a wedding. With the Oscar’s coming up and also LA LA Land recently taking cinema audiences by storm and receiving 14 Oscar nominations this year, there is a lot of love for Tinsel Town right now. 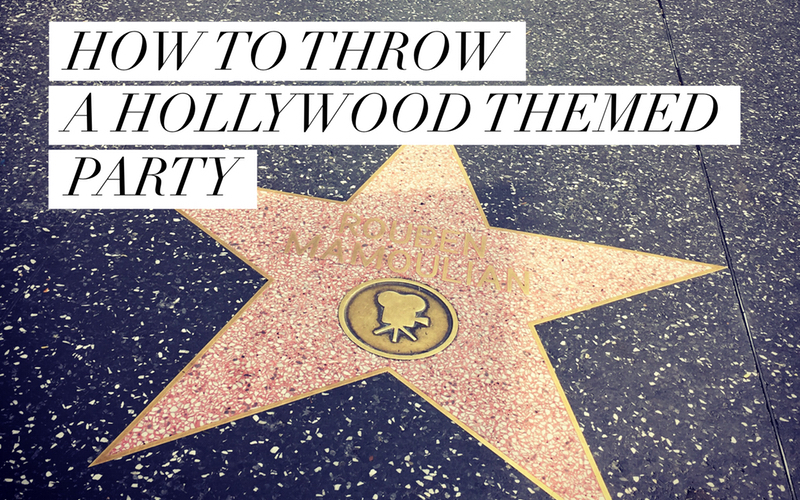 The Function Junction presents our top tips and advice on how to throw a Hollywood-themed party. A Hollywood themed party is not the same without a glamorous dress code. Make sure to state on invitations that it’s black tie, ‘red carpet glam’ or similar, so your guests know exactly what to expect on the night. Ladies can shimmer in long glitzy gowns fit for a Hollywood A-lister and and what guy doesn’t love donning a tuxedo in order to impress the ladies? Gold and silver are definitely the colours of choice for any Hollywood themed party, as well as glitter and diamante’s or crystals scattered liberally across tables and fair lights draped across the room. Let your guests make an entrance by letting them walk down a red carpet as soon as they arrive. For a fun idea, hire comedy paparazzi to take photos of your guests throughout the night, plus they can even take home a snap as a souvenir. FJ’s favourites are the Party Pappers. Go-all out American with the food for your Hollywood themed party for a fun twist. Mini burger sliders and hot dogs can be handed out as substantial canapés and then serve cheesecake and boozy milkshakes for dessert. Why not hire a popcorn cart for guests to help themselves to during the night. For a fancier affair, a sit down 3 course dinner like celebrities have whilst at award ceremonies is a must for Hollywood themed parties. Just don’t forget the Champagne! Make like LA LA Land and take inspiration from the films soundtrack, with a jazz or swing band playing live at your event. It’ll instantly add sultry glamour and atmosphere to any occasion. The Function Junction has a wide variety of superb jazz and swing live bands to suit all budgets. For a vintage twist, Portobello are a sophisticated vocal group and band who perform modern pop songs and jazz songs in a group harmony style, check out their live video here. The Jazzbomb’s are a 7-piece live jazz band playing Rat Pack tunes and well-known jazz and swing numbers. For a high-energy performance, the suitably named Vodka Martini’s cover all the jazz classics and even 60’s and modern pop tunes. Hire your very own Ryan Gosling from LA LA Land and have a jazz pianist play at your event, like our very own Richard Busiakiewicz - he’s even played at Paul McCartney’s wedding. For all live band or DJ enquiry, please don’t hesitate in contact the Function Junction by e-mail or give us a call. We’ll be happy to help!